The infant class is for children as young as 6 weeks until they turn 15 months. The infant room is designed to be a supportive “home away from home” for our youngest children. 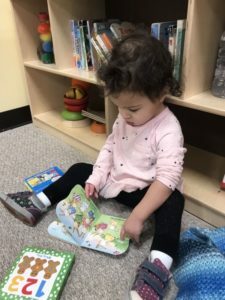 Our mixed age infant room allows the children to participate in secure and continuous relationships with their teachers until they are ready to transition to the toddler room. 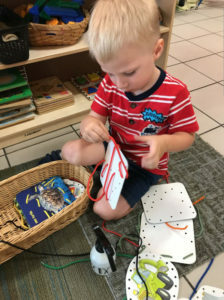 The classroom is organized in a way that provides the exploring toddler with many and varied opportunities to discover their effect on the world. 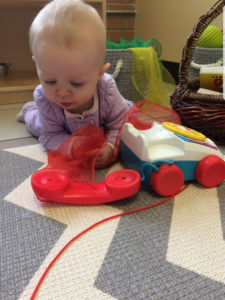 An activity such as exploring cause and effect through the use of large tubes and cars, digging in a sand-filled sensory box, and mixing finger paints over a large canvas help the 1 year old make connections and increases their desire to further explore. 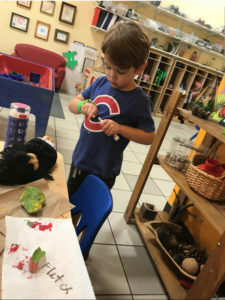 The classroom is organized in a way that provides the curious young preschooler with many and varied opportunities to investigate and make meaning of our world. Activities are designed to support this age group investigate all of the things that make them ask, “why” and “what”. Children may engage in imitative pretend play as a way to answer the questions about why adults do certain thing, they might explore a variety of art materials as they wonder what will happen when they push very hard with a pastel on paper, or they might raise frogs from tadpoles if the children ask why frogs live near water. The Junior Kindergarten Class is for children who have turned 3 years old by September 1st of the school year and is designed to facilitate the young junior kindergarten child’s imagination, curiosity, and peer- relationships while supporting the older junior kindergarten child’s early academic, social-emotional, and creative skills. The class will have a maximum of 20 children and 3 teachers.